Start a Christmas bells tradition in your home next Christmas. Whether you learn to play a song using handbells or simply begin decorating the Christmas tree with bell ornaments, bells are perfect for making holiday memories. The significance of bell ringing was thoroughly documented in the classic 1946 Christmas film It's A Wonderful Life. In it, the famous quotation by character ZuZu Bailey is that ". . . every time a bell rings an angel gets his wings." Bells continue to be an important part of the holiday season today. Though the exact history of Christmas traditions like bells are unknown, some common facts do lend themselves to a good summary of where the bell tradition originated. Historically, bells were rung to ward away evil spirits or scare away demons during Pagan times. When Jesus Christ was born, Christians may have rung the bells to warn demons of the birth of their Savoir and/or celebrate the joyful news of Jesus' birth. Around the same time, bells in churches were rung as a way to announce something, such as weddings or a birth. 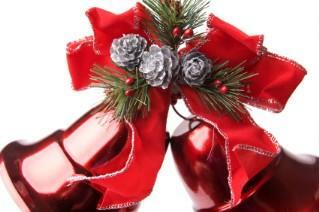 Bells became associated with happiness, and people rang them on Christmas in honor of the merry holiday. Today, bells are a common symbol for Christmas. Salvation Army volunteers ring them to announce their location for charitable giving, and even Santa's sleigh is adorned with bells. Reading Christmas stories together is a tradition for many families. Look for books and poems that include bells as a main element in the storyline. A Christmas Bell for Anya is an illustrated book that features the tale of Russian child Anya, who is chosen to ring the bell on Christmas morning. The classic book Polar Express uses a bell as a symbol for childlike belief in Santa and the spirit of Christmas. Bells are traditionally an instrument for making music. They have historically been and continue to be carried by people who go Christmas caroling in their neighborhoods. Handbell choirs are often part of church or community groups. Orchestras and bands may also feature handbell songs during the Christmas season. Look for Christmas sheet music designated specifically for handbells at your local music store. The poem Christmas Bells by Henry Wadsworth Longfellow eventually became the hymn called I Heard the Bells on Christmas Day. Longfellow originally wrote the poem during the midst of the Civil War after his son was wounded. Later, it was set to tune and became the well-known holiday song. Christmas bells traditions continue in households as a Christmas custom around the world as families create memories that involve holiday bells. Tell us how you use Christmas bells in the "Comments" section below.